The Latin American and Caribbean Cultural Society, LACCS-UK, is celebrating its Pearl Jubilee. For 30 years LACCS-UK has been producing classical guitar and symphonic concerts in London. LACCS-UK, an independent body, has represented more than 400 artists in two decades of continued activities. Professor J.R. Monroy, its President, believes that it is particularly through classical and traditional music that the cultural heritage of Latin America will be preserved. LACCS-UK has become an international agency, presenting artists from around the world. LACCS-UK is a professional body which takes pride in the management and production of its activities to attain a high quality finished product. On behalf of LACCS-UK I thank all of them for their understanding and support to our corporate commitment to the music and the culture of all nations. Here is a selection of some of the greetings. 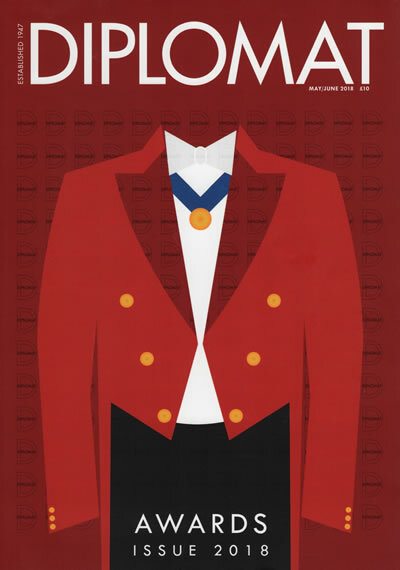 The Magazine Diplomat has written an article about LACCS-UK 35th Anniversary. 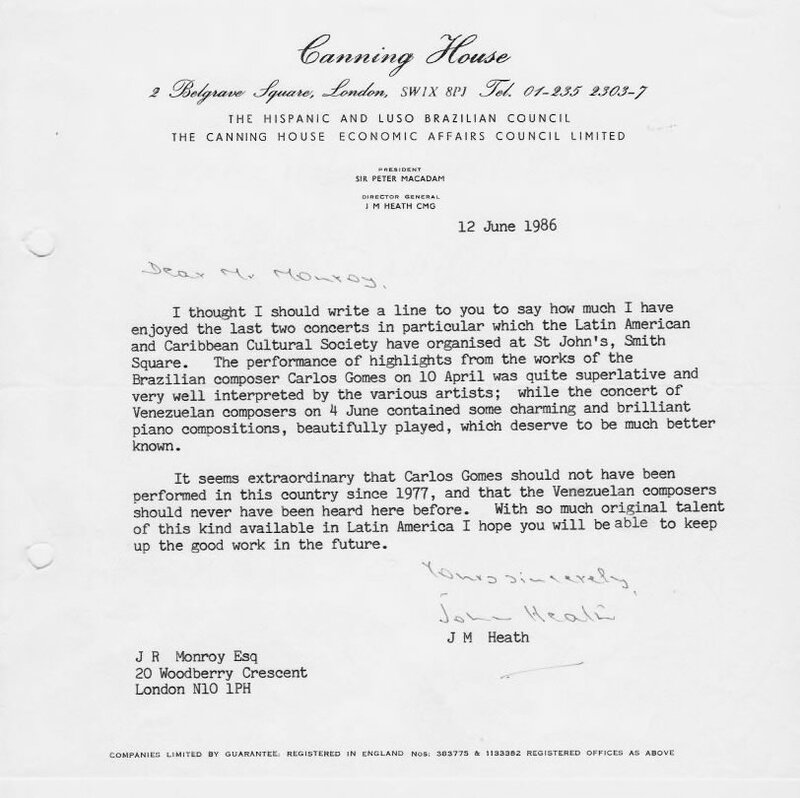 In LACCS-UK are please to publish an interesting letter which was written by Mr John Heath, Director General of Canning House in London in 1985, on the occasion of LACCS-UK first concerts of Latin American Classical music at St. John's Smith Square, An historical testimony of LACCS-UK commitment and dedication to the music of the New World and the world. "Dear Juan. Congratulations from China on your 30th Anniversary. We in China know of your great work and contribution to the world of music and to make a better world through your art. Many more years of continued success." "My congratulations goes to J. R. Monroy, Professor Emeritus UCH, Founder and Chairman of LACCS-UK-UK, in celebrating 30th years of promoting the music of Latin America in U.K. I am very proud to have participated in three opportunities, representing the Chilean music in LACCS-UK's international concerts. All these years, LACCS-UK has been an artistic platform for many artists from all around the world, with special attention to musicians and repertoire from Latin America and the Caribbean region. 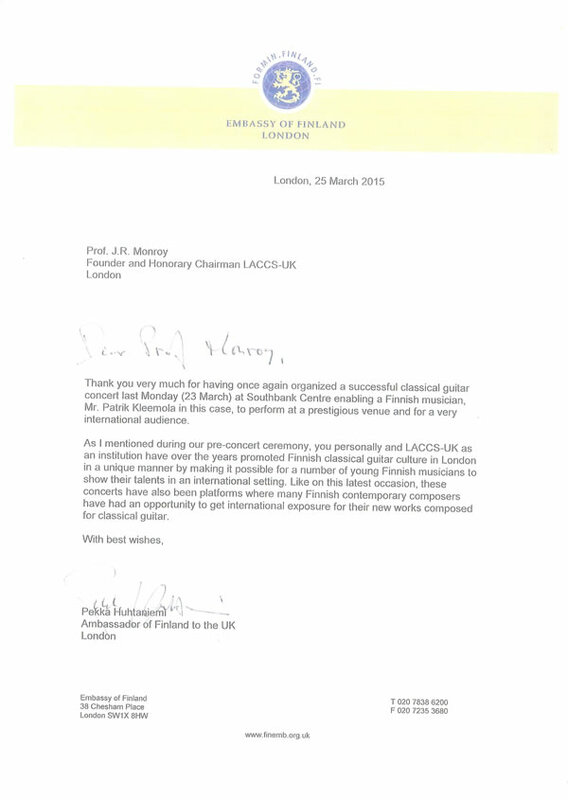 We are grateful to LACCS-UK for giving us the opportunity to perform in the international concert halls in London, e.g. Southbank Centre, Barbican Hall, Wigmore Hall, Leighton House and St. John's Smith Square. Professor J.R. Monroy and LACCS-UK has accomplished an important mission in U.K. which he has been bringing for the last thirty years to the British audiences classical music and musicians from Latin American and the Caribbean. His dedication, understanding and commitment is well recognised by very many artists and musicians from around the world. Prof. J.R. Monroy with his musical expertise has contributed to enrich the musical culture in London and in U.K."
I want to send my warm congralutations to Juan Monroy and LACCS-UK-UK celebrating the 30th anniversary of the organization, that always had creative and highly successful activities on promoting the culture of countries of Latin America, the Caribbean and other regions of the world. I have had the special pleasure of taking part in many wonderful events, always conceived with the highest artistic standards, with successful reception from the audiences in the UK, hoping this will be stimulant to future generations that love the Arts and Music from the Americas. Carlos Barbosa-Lima, Sao Paulo, Brazil. The musicians and staff of the English Chamber Orchestra send their congratulations to LACCS-UK on the occasion of its 30th Anniversary. The ECO has performed at many of the concerts presented by LACCS-UK over the past decades, and each has turned out to be an exciting and original event. We are very happy to continue our long association with LACCS-UK and wish you all the best for the next 30 years! Greetings to LACCS-UK 30th Anniversery! We are very happy for all wonderful guitar concerts that has pleased the audiences all over Europe during 30th year! We hope you will continue your important mission for the guitar by inviting some of the worlds most dedicated guitarists. Thanks a lot for your contact! Nice to hear from you after many years and congratulations for your succesful organisation celebrating Anniversary! The Anglo Latin American community in this country owe you a great debt of gratitude! Your kind wishes are heartily reciprocated! Difficult to believe that shortly you will be celebrating your 30th Anniversary – where have all the years gone! Wishing you and LACCS-UK every continued success. Thank you very much for so kindly and generously inviting me to the excellent concert of Brazilian and Argentine Music, played by the Slovakian guitarist Jozef Zsapka and his flautist wife, which I enjoyed very much. I should be delighted if you would be so kind as to let me know of future events in the programme of the Latin American and Caribbean Cultural Society, and grateful of further opportunities to enjoy Central and South American art and music. Thank you again for the lovely concert. It was really high standard. I'm sure everybody enjoyed the concert very much. I would like to avail myself of this opportunity to congratulate you one more on LACCS-UK 30th Anniversary and wish many more years of wonderful activities for the benefit of the international community living in London and our British hosts, as well. I was delighted by your invitation and I enjoyed very much the Latin American influenced programma on flute and guitar which absolutely charmed our ears with the balances and blend of the sounds. Thank you very much! It was a lovely evening for us! We enjoyed the presence and the great music of two talented artists, Dagmar & Jozef Zsapka. And since it was the first time at one of your concerts, this was also a charm experience on hearing their combined sounds of flute and guitar. The whole atmosphere of the evening was very pleasant and we felt very well being there. On top of that, the reception was a great opportunity to get know the other guests. LACCS-UK's concert by Dagmar & Jozef Zsapka held at the Purcell Room, was most enjoyable and again I congratulate LACCS-UK for its original idea to include the music of four South American composers, which is not very common in the London concert scenario, even at the Southbank Centre. Congratulations LACCS-UK and keep on with the good work! Thank you so much for invited us to the concert perform by Dagmar & Jozef Zsapka on the 22nd October. It was very enjoyable evening and lively music. May I take this opportunity to express my sincere gratitude for your kind cooperation in organizing the Baltic Guitar Quartet concert which took place o 7 February 2012. I truly believe that without your professional organization, efficient communication and fundraising skills as well as attention to detail, we wouldn't have had such a successful event. I was an exceptional opportunity to showcase our brilliant young musicians and promote Lithuania among London diplomatic community, guitar lovers and general audience. I deeply appreciate your kind efforts and very much look forward to future collaborations. Thanks you very much for your very professional involvement with the project THE BALTIC GUITAR QUARTET. It was diligently organized and was certainly a success. Our most sincere gratitude to you for all your efforts organizing the concert. Just would like to say thank You so much for lovely opportunity to hear such wonderful musicians another evening. We enjoyed so much and I know how much work its involved with organizing such event. Lots of credits to you to make all this happens! A very big thank you for inviting me to the spectacular guitar classical evening. I must say I think it was one of the best I have been too, thankyou. Thank you for organizing such a pleasurable concert. The Baltic Guitar Quartet were great and we did enjoy their playing and choice of pieces. I am writing to you to covey my sincere thanks for organising such as wonderful evening with guitarist Petri Kumela at Purcell Room last week. I do hope that we can work with Latin American and Caribbean Cultural Society again in not too distant future. As a token of our appreciation for all your efforts I am enclosing a recently published book 'A history of Finland', I hope you enjoy. I thank you, indeed, for the lovely solo guitar concert... my apologize for my wife's/Maggie absent due to her sore throat, which I, too, suffers. The reception was an enjoyable one, and I do hope, we can get together again, in the very near future as your address has already put in my list. Again, my sincere thanks for your kind invitation, Dear Professor... and many more success with your always valuable endeavour. I would like to thank you and the H.E. The Finnish Ambassador Mr. Pekka Huhtaniemi for the invitation to the concert in Purcell Room last night. I enjoyed the concert given by Petri Kumela on his classical guitar and the opportunity to meet a number of your distinguished guests during the reception. Sorry, that my wife could not attend. She is sends her apologies and conveys her best wishes. Thank you once again for the spectacular guitar concert featuring the compositions of King Bhumibol of Thailand! In addition to enjoying the music, I feel that I learned quite a lot about the Thai royal family from the photo-exhibition. The concert was well-attended and I can see that you have a good rapport with the diplomatic missions here in London! Thanks again for the invitation! I have moved to a new department at King's College London and I now have quite a few colleagues from Argentina, Columbia and Peru. They were all jealous of me for having attended the Bicentennial Concert back in September. If you happen to organise any other cultural events featuring South America, could you please let me know? I would like to thank you very much for the reception. It was an honour for us to be at your party. We look forward to meeting you soon; and, we are very keen to be acquainted with more people from Chile for the good reputation the country has. The concert was excellent. Ekachai Jearakult is no doubt an outstanding performer. The beauty of St. John's Church was a key addition to a great show. I just wanted to say a very large thank you for your kind invitation last week to the Thai Celebrations. The evening was one of the best I been too for a long time, please keep me in mind for where I can support you in the future. Hope this email finds you well. Just thought drop you an email to say many thanks for the brilliant night of last week about the celebration of the 50th anniversary of the royal visit of their majesties the king and queen of Thailand to the united kingdom. It was amazing time that has proven how good you are at dealing with people and pleasing your contacts I really appreciate you for that. I would like to express my appreciation about the organization of the event from you and your magnificent team work that seemed highly skilled, professional and productive, Dr. Monroy you are the positive spirit of the LACCS-UK. Hope to see more events very soon. Please excuse me for taking so long to come back to you. I have been abroad for some holidays and have just returned to find a lot of work piled up on my desk. But let me very briefly thank you once again for the wonderful concert on the 15 of September to celebrate the Bicentennial of Colombia, Venezuela, Chile, Mexico and Argentina. I truly enjoyed this musical homage to South America in its whole variety and I was also amazed by your ability to organizing such an outstanding performance given the last minute cancellation of one of the originally announced artists. Alkan Volkan London Press Club. Thank you ever so much for the most enjoyable and spirit-lifting concert this past Wednesday. (Colombian Bicentennial Concert at Purcell Room South bank Centre: 15th Sept., 2010.) It must have been quite stressful to have to find replacements for the pianist who was unable to come, but the concert was definitive a great success! Thank you so much for splendid concert last night to celebrate the 200 Years of Independence of Colombia. (Colombian Bicentennial Concert at Purcell Room South bank Centre: 15th Sept., 2010.) The Artists were superb and the programme very interesting. I felt at the end I wanted to dance. You organised a splendid occasion for us all and my friend and I send you our thanks and congratulations. I hope very much to see you again. It was truly a pleasure to meet you in Berlin and I am grateful for your participation as a speaker in our Europe Meets Latin America programme. The feedback from young leaders regarding your participation was quite positive and in many ways it was really excellent to have you here. I am writing to you with my great appreciation for your personal efforts in organising a very memorable musical evening by Galina Vernigora Vale, a prominent Ukrainian guitarist, on 28th October 2009, at the Purcell Room, South Bank Centre. As on many occasions you, dear Professor Monroy, have been most instrumental in raising the awareness of the Ukrainian culture in London by choosing the best performers and events. Ukrainian Embassy personnel, our friends and colleagues thoroughly enjoyed the performance. I am also delighted to know that the guests attending to the interval reception liked the Ukrainian wines provided by our Embassy. An interview with Mrs Vernigora Vale will appear in one of the next issue of the Ukrainska Dumka newspaper. Let me assure you that we value your activity very highly and we are looking forward to our continued co-operation. With best personal regards, I remain. Thank you very much for the invitation to Galina Vernigora Vale' s excellent recital last Thursday - I greatly enjoyed her high artistic performance, as well as the possibility to meet you and the friends of Ukraine. I wish to express my sincere appreciation for the invitation to attend the concert given by Galina Venigora Vale at the South Bank Centre on October 28th, 2009. A colleague from the High Commission accompanied me to the concert and we both enjoyed the event. Mrs Galina Vernigora Vale is an exceptional gifted guitarist and it was a pleasure to see her perform. On e again, please accept my thanks for a very enjoyable evening. Thank you so much for inviting me along my guest to the evening at the Purcell Room last Wednesday, Galina is undoubtedly a talented classical guitarist and she has a good sense of hum our too, making a wonderful package and we enjoyed it thoroughly. The wine reception was also enjoyed! The Ukrainian wine was very good indeed. My guest, Ms Rutt Quingley, has asked me to convey her sincere thanks for a delightful evening. I would like to thank you for the lovely evening of Galina Vernigora' s guitar concert on 28th October 2009. I had a lovely time. I would like to thank you and the members of the Latin American and Caribbean Cultural Society for the invitation to attend the concert of Duo Paganini to celebrate the Bicentennial of the Republic of Ecuador (1809-2009). It was a pleasure to meet you and some of the other guests and it goes without saying that my wife and I thoroughly enjoyed ourselves. The performance of Jorge Saade and Julio Almeida were exceptional and their music will stick in our minds for some time to come. Thank you again for giving us the chance to join to you for such an enjoyable cultural evening. Desde Lima, mis mejores deseos... ¡éxitos, logros y realizaciones! On behalf of my partner, Jolien Janse, as well as my colleagues, Jose Maura and Chrystelle Clement, please let me thank you for having invited us to the excellent concert last week and to the Reception to celebrate the 25th Anniversary of LACCS-UK. We very much enjoyed the interesting choice of music from both South America and from closer to home. I hope that we will have the opportunity to see you again in not too distant future. I am writing to express my sincere congratulations for the 25th Anniversary of the Latin American & Caribbean Cultural Society and specially for all your contribution and support for the Latin American art and culture throughout these years. May I wish you all the the best and success in the coming years. I also take the opportunity to thank you again for your kind invitation to the concert of Andriy Ostapenko for the Celebration of 16 years of diplomatic relations between the United Kingdom and Ukraine, event which I attended and fully enjoyed. I would like to thank you again, also on behalf of my colleague, for the invitation to the wonderful guitar concert. We very much enjoyed this evening of outstanding musical performance in the beautiful setting of Leighton House Museum. Thank you very much for a spectacular evening of music. My wife and I thoroughly enjoyed the occasion. Thank you so much for having invited us to a wonderful guitar concert. My wife and myself really enjoyed beautiful performance as well as the venue. I look forward to seeing you again before long. Japan Europe Business Support (JEBS) Ltd.
H.E. 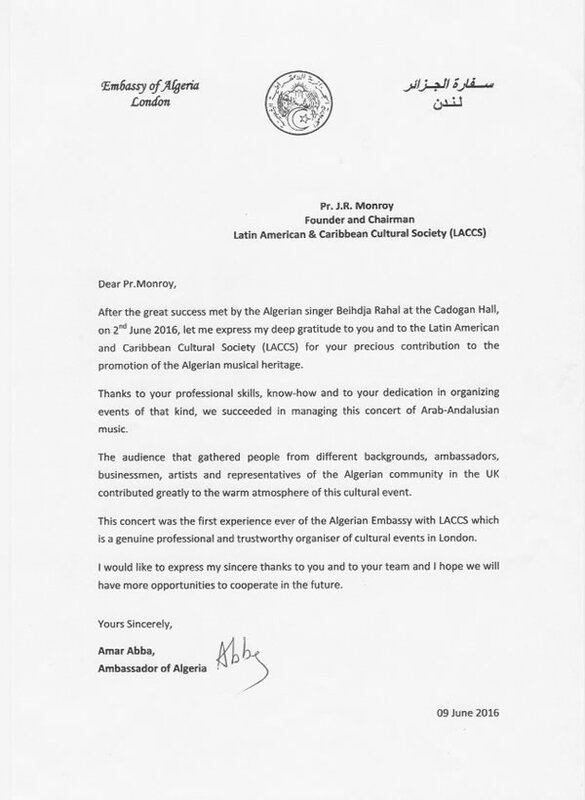 The Ambassador of Brazil has asked me to congratulate The Latin American and Caribbean Cultural Society (LACCS-UK) on its twenty-fourth anniversary. Your contribution to cultural life is invaluable and greatly appreciated. May I again convey my thanks and that of the many Maltese and other guests who were privileged to attend and enjoy Simon Schembri's recital at the South Bank Centre. I was most impressed by the seamless organisation and also you personal commitment to ensure the event's success. 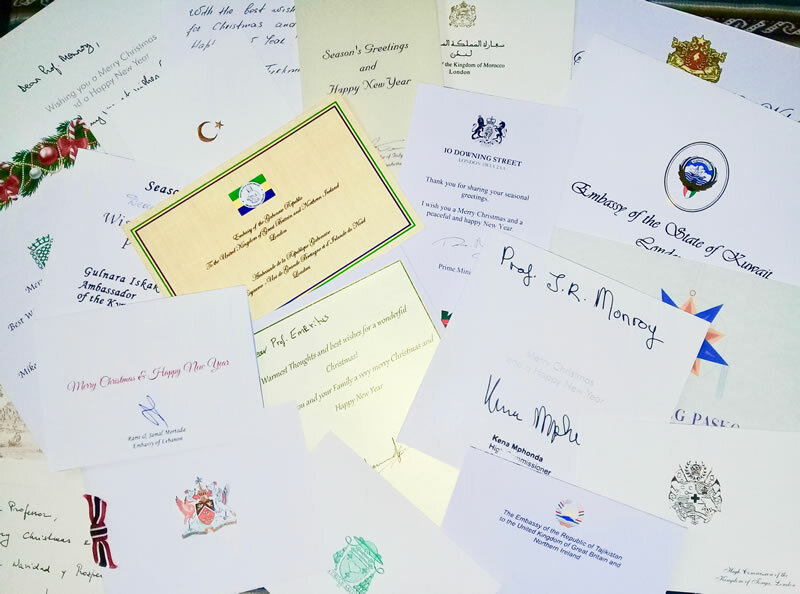 I am sure you will be pleased to learn that I have since received several letters of appreciation and thanks from colleagues in the Diplomatic Corps as well as from many of our other guests. I would like to take this opportunity to thank you for arranging the wonderful guitar concert by Ismo Eskelinen on the 16th February 2007. Your continued interest in bringing Finnish guitarist to London is very much appreciated by us all and we hope that our co-operation will carry on for years to come. I would like to thank you for organising Vladislav Blaha's most excellent concert at the Leighton House Museum on the 24th October 2006. All our guests enjoyed the concert and the beautiful venue enormously. The Czech Embassy highly appreciate your initiative and we are grateful for you for bringing to London one of our leading guitar players. I am grateful for your support of Czech music and please accept my repeated thanks for organising the successful Leighton House Museum concert. I am writing to inform you that after nearly four years of service as Ambassador Extraordinary and Plenipotentiary of the Republic of Belarus my tour of duty in this capacity is coming to an end. It is indeed needless to express how much I have enjoyed working closely with you during my term of office. What I appreciated most was your friendly and genuinely frank attitude and ultimate integrity towards co-operation with myself and the Embassy of Belarus I have headed. 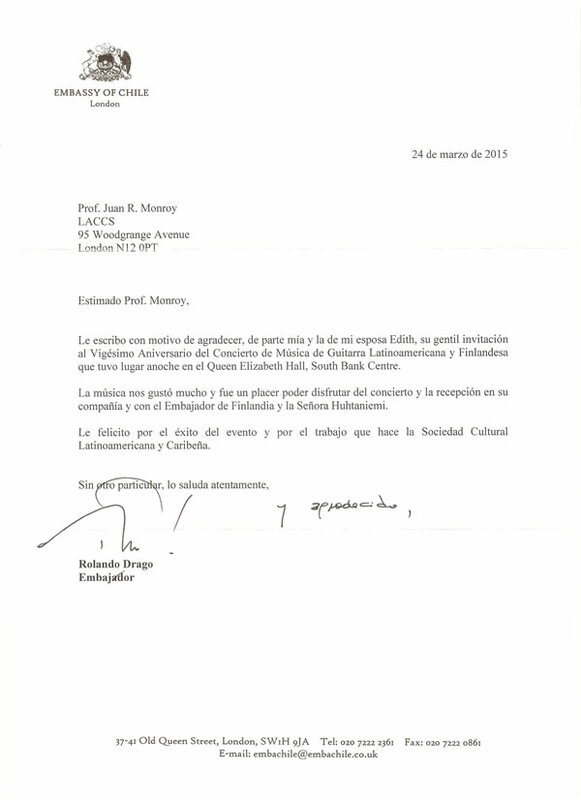 Please, accept, dear Professor Monroy, the assurances of my highest consideration. Many thanks again for your kindly inviting my wife and myself to attend the fantastic Tango Trio concert. It's our first time to attend such a wonderful event in London since we came here. The Tango music and dancing are really familiar to most of the Chinese people, as you already know, but it's a somewhat different experience to enjoy that in London. And your devotion to the cultural exchange for the last 20 years and the fruitful results you have got are what you should be proud of, I believe. So I felt it was an honour to have met with you and hope to keep in touch in the future. I endorse the work of the Latin American Caribbean Cultural Society (LACCS-UK) and thank you in particular for your efforts in enabling the highly esteemed New Zealand artist Matthew Marshall to perform in London at such a well-known venue. I know that Matthew Marshall appreciated your efforts in promoting his classical guitar talent to the larger United Kingdom audience and for providing him with this international concert opportunity. Just a brief note to say how much both my guest and I enjoyed the concert on Friday last: really one of the best so far. Thank you once again for inviting me and I look forward to more good music in the future. I would like to express to you my most earnest thanks for your considerable endeavour in arranging such an enjoyable evening for my wife and myself last night. We thought the event both educational and musically delightful. The refreshments at the interval were most appreciated, and my wife and I thank you for your generous hospitality. May I also prevail on you to thank, on our behalf, the young blond-haired lady in the black trouser suit, who was such a perfect hostess, and made us so welcome. I have told my colleagues how successful the evening was, despite the awful rainy weather, and I think there is much regret that they were not able to be with us. May I wish you every success with your future recitals. We have had the pleasure of working with LACCS-UK regularly over the last ten years, and can testify to the excellent work which the organisation does in promoting music and musicians from Latin America and the Caribbean. Their exciting programming has introduced London audiences (and musicians) to a wide range of music much of which is rarely heard in the UK, and offered many Latin American and Caribbean performers the opportunity of a Britain platform. It has been a pleasure to work with Mr Juan R. Monroy and LACCS-UK in the past, and we anticipate many more collaborations in the future. In the meantime we are delighted to wish LACCS-UK a very happy and successful 20th anniversary year - keep up the good work in promoting Latin American and Caribbean music and artists in the UK, and best luck for the next 20th years and beyond! It was a pleasure to work with CBL and the ECO in what was a completely new repertoire for me. I hope the reviewers enjoyed it all! You are to be heartily congratulated on your success in introducing this music to us in this country - I hope that you will have equally as much success in the next 20 years. I would like to congratulate you with the 20 th anniversary of LACCS-UK. Your wonderful concert series with exciting performers, playing works that the audience has not heard before is a great contribution for the guitar life in Europe and all aver the world. I believe LACCS-UK will continue to present to the British audience in a such a successful way the Latin American culture through many new U.K and world premieres at the RFH in London. I would like to thank the Latin American and Caribbean Cultural Society (LACCS-UK) for organising an excellent concert with the young Austrian Alexander Swete on 20th October 2003, at the Purcell Room, South Bank. Without the initiative of LACCS-UK, and especially your own efforts, Professor Monroy, this concert would not have been possible. I could witness that the whole audience, as I was myself, was very taken with this performance of a very interesting programme, spanning the Latin American and Austrian guitar traditions. Mr Swete is certainly a highly talented and engaging young artist, who deserved our joint support. In co-operation with the Austrian Embassy and the Austrian Cultural Forum, LACCS-UK has made the London concert debut of Mr Swete possible, and I would like to thank you again for taking the initiative in making this possible. I have been following with great attention the work of your Society for quite some time. The concerts you are organising at the Royal Festival Hall are of great significance for exchanging diverse cultural values from different parts of the world. These event are not less important for composers and musicians themselves who have an opportunity to perform in one of the leading cultural centres in the world. I would like to thank you very much for all the work that you have put into organising Vladimir Mikulka's concert at the Purcell Room, Royal Festival Hall on Wednesday 24th March 2004. It was a most enjoyable evening and we have had many positive comments from our colleagues from the diplomatic community. I wish you a lot of success in you future ventures. I Would like to take this opportunity to congratulate you upon the success of the LACCS-UK guitar recital with Alexander Swete. Once again, you select an outstanding musician for the series, which provide a unique platform in London for guitar recitals with international artists on the high level. Alexander Swete appreciated the opportunity to perform for a substantial and knowledgeable audience. We were very pleased with the large audience numbers and with the presence of the members of the Diplomatic Corps as well as British and Polish press at the concert of Andrzej Mokry. The programme, combining and comparing the music from Europe and South America and presenting Polish Renaissance and 20th century music, was interesting and original and very well received. The Polish Cultural Institute is very pleased to have been involved in this successful promotion of the Polish culture heritage. Andrzej Mokry's debut concert in London was very well organised and promoted, and created a positive image of Poland as it is preparing to enter the EU. Congratulations! Promoting any arts event is never easy and to continue to do so for twenty years has to say something about the courage, enthusiasm and sheer determination of the power behind it. When this is added to the vast range and quality of performances we have experience over the years it is a truly magnificent achievement. I have been involved with LACCS-UK in a very modest way both as a reviewer and provider of programme notes for much of the time it has existed and I am constantly delighted by the new ideas and music which are promoted. Long may Juan continue to do so! On the twentieth anniversary of LACCS-UK I would like to congratulate you for your marvellous achievement and thank you for all the pleasure you have given us through the most enjoyable concerts. They bring to us such excellent traditional and modern music and performers from Latin-American and many other countries, and give us the opportunity to learn so much more about the world's present and past music. I send my heartiest congratulations to Mr Monroy and his staff at the Latin American and Caribbean Cultural Society on their 20th Anniversary. Mr Monroy has a unique ability to bring together people from different and diverse parts of the world in a delightful spirit of friendship in order to celebrate that greatest of international languages, music. My experience in February 2004 was both artistically and personally most rewarding. BRAVO LACCS-UK and lets all look forward to many more years of success! have been of the cultural highlights of my four years in London. enjoy at least another 20 years of such success! Canadian High Commission/Haut Commissariat du Canada. Two people carrying high the beautiful flag of some of the best music from Latin America, in England! It has been an honour and privilege to have been part of such great concerts and artistic activities promoted by LACCS-UK, through out all these years, always with great professionalism and good taste. Congratulations! "Many congratulations and I wish the Society's prosperous future. Best regards." "I very much value your contribution to the programme in the Purcell Room. 20 Years is a very long time and you have built up a wonderful reputation as a promoter of some very good artists here". Catherine Alexander, Royal Festival Hall. London.
" ... It was very kind and generous of you. It was very imaginative of you to sponsor this concert, which was most enjoyable. I particularly liked the 12 Etudes... ( Heitor Villa-Lobos). Mr Stuart Pyle, Europe and World Trade Directorate, DTI. England. "I know the concert has been a success and I congratulate you for this initiative"
Gerard Errera, L'Ambassadeur, 28th March, 2003, Londres. European music has borrowed a huge amount of material from Latin American folklore. It is very important for European to have chance to hear the original art. In these circumstances music is not only pretty sounds, but creates understanding between people. I want to wish good luck for your series for the next 20 years and it is very important that you keep Latin American and Caribbean music in London scene. I understand it requires a lot of rigour and determination." A big cheer for LACCS-UK from around the world. Bob Bellows, Singer and Pianist, Zhuhai, China. Happy 20th Birthday in U.K. to LACCS-UK. A major milestone in providing good quality Latin music entertainment in U.K. I was very honoured to have played at least a small part in the Sept, 2001, Carlos Barbosa-Lima classical guitar recital at the Purcell Room. This was the very first time history that 'Ukelele' solo was feature in that hallowed hall and the first time in history that a guitar with 'ukulele' duo was ever featured in concert anywhere ( and on a Latin number, "Tico Tico")! And as you may know, the 'ukulele' evolved in Hawaii after it arrived in the form of the braguinha from Portugal in 1879. Many happy returns to LACCS-UK! Byron K. Yasui 'Ukeleleist, guitarist, double bassist, composer, arranger, music educator. Hawaii, April, 7th, 2003. Happy Birthday! Thank for the extraordinary contribution you have made to the musical life of London and the world. May the next 20 years be as amazing! Roland Chadwick, Composer and guitarist, Australia. You and Juanita have developed a substantial contribution to culture in this country. I know from experience how much hard work, faith and dedication is involved. The Latin American and Caribbean Cultural Society deserves a much wider public recognition and I hope the next twenty years will see you on television with your own programme." "All best wishes and good luck for your 20 years' celebration". Pam, Royal Festival Hall, London. It is with a great pleasure that I send my warm congratulations to LACCS-UK (Latin American and Caribbean Cultural Society) at is Twenty Anniversary, for bringing the best of the Arts and Music to London. Always with the highest aim of promoting the rich cultures of the Americas in Europe, expanded world-wide. A special salute to Juan R Monroy, President of LACCS-UK for his imagination and perseverance. When Classical Guitar magazine ended its series of guitar concerts in London, the only organisation left that consistently presented the best international guitarists in England¹s capital was Juan Monroy¹s Latin American and Caribbean Cultural Society. Bearing in mind the difficulties involved in keeping alive what is at best a minority interest (as the whole of classical music is), LACCS-UK has done wonders. Its concerts were events to look forward to. They featured mainly the guitar (virtually a national instrument in many South American countries), though I remember an Italian harp ensemble of seven young women, who I believe brought their instruments with them; that must have presented some logistical problems. Then there was a tango evening, with some spirited dancing. The concerts were (and are) very well attended, invariably with a large proportion of South American expatriates but with discriminating Londoners as well. Many of the world¹s great and good have played at LACCS-UK concerts, not all of them from South America and the Caribbean. The reason is simple: Latin-American music is immensely popular the world over, and good musicians everywhere have learned to play it well. In any case, the repertory is not confined to music from South America; popular as Barrios and Piazzolla are, the LACCS-UK audience does not insist on an exclusive diet of their works. Such is the international status of the guitar that you are quite likely to hear a guitarist from Brazil playing Bach in one concert, and a guitarist from Germany playing Piazzolla in the next. There are no rules, and no boundaries; the only stipulation is that South American music must appear somewhere in every programme. The guitar is a comparative newcomer to South America, where wind and percussion instruments formed the old tradition. Then Spanish and Portuguese invaders brought the Baroque guitar with them, and the Indian population quickly adapted it to their own purposes in the form of the charango. That was the beginning. Enormous progress was made in a remarkably short time, and South American guitarists are now among the best in the world. The great Agustín Barrios Mangoré, a virtuoso player and a composer with a touch of genius, is said to be the first to perform a Bach suite in its entirety. That was in the early part of the 20th century, before anyone in Europe had got round to it. Since then outstanding musicians have appeared regularly: Laurindo Almeida, Alirio Díaz, Sergio and Eduardo Abreu, Roberto Aussel, Eduardo Fernández, Carlos Barbosa-Lima, Alvaro Pierri, Jorge Morel, Jorge Cardoso, Abel Carlevaro, Ricardo Iznaola, Eduardo Isaac, Manuel Barrueco, Sergio and Odair Assad, Pablo Márquez, Paulo Bellinati, Máximo Diego Pujol, Fabio Zanon, Carlos Pérez < the list is a long one and could keep LACCS-UK busy with concerts for decades to come. I hope LACCS-UK will continue its good work. Music is generally a depressed area these days, but Juan Monroy has shown that idealism, patience, and a determination not to give up when things get difficult, can produce results. The musical scene in London is significantly richer for his activities. Long may it continue to be so.